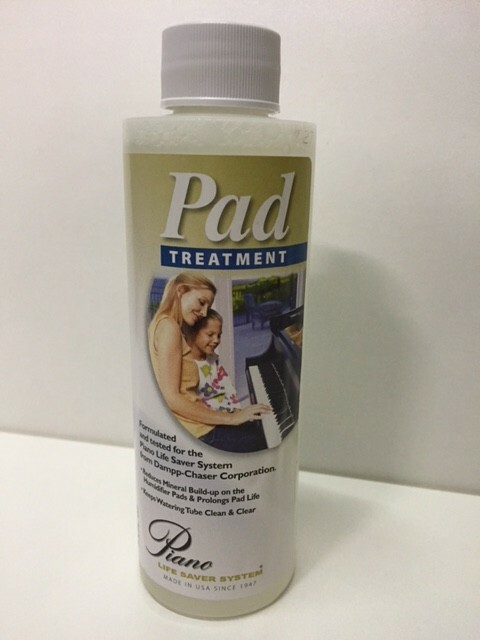 This Product is to reduce mineral build-up on the Piano Life saver system humidifier pads and prolong the life of the pads as well as keeping the watering tube clean & clear. The Humidifier treatment also reduces the risk of Mosquito lava from breeding in the water of the System. Should the pads become caked with mineral deposits or harden on the top, then the system does not work to the best of its ability. The effectiveness of the system breaks down. In some cases the Pads need changing twice a year. Generally once a year is enough. Gary will always check these and maintain the system when he comes to tune the piano. The Pad Treatment can be bought from Gary at this time as well. For more info please see the Piano Life saver system category or contact us on 9477 5866.